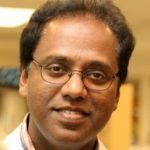 Dr Karunakaran’s present research interest at the BC Centre for Disease Control (BCCDC) involves identifying vaccine targets for Chlamydia trachomatis using a novel dendritic cell-based immunoproteomic approach. This approach involves identifying Chlamydia-derived peptides binding to MHC molecules on the surface of dendritic cells by tandem mass spectroscopy to allow genomic information to guide the delineation of the complete immune proteome of Chlamydia. This methodology has lead to the identification of many novel vaccine candidates that can be further developed into a vaccine against human Chlamydia infection. His previous research work at BCCDC involved molecular approaches to study chlamydial pathogenesis. He undertook detailed bioinformatic, genetic and immunologic studies of the three chlamydial groEL genes and proteins to determine if this could shed light on their role(s) in chlamydial pathogenesis. Dr. Karunakaran also investigated the roles played by the Chlamydia pneumoniae bacteriophage PhiCpn1 in relation to C. pneumoniae pathogenesis of atherosclerosis. In this study, he developed methodologies to detect the presence of the phage in clinical isolates of C. pneumoniae and of phage-related antibodies in sera from humans to further investigate the relationship between C. pneumoniae infection and vascular disease. At BCCDC, he also developed a serologic test to quantify humoral immune response to the Human Papilloma Viruses. The aim of this study was to implement and validate a serologic test to quantify the subtype specific humoral immune response to the HPV16 and HPV18 based on detection of neutralizing antibody to the respective subtypes. This test is now being used at BCCDC to ascertain the level of type specific neutralizing antibody after HPV vaccination and to potentially correlate this with protective vaccine efficacy. During the SARS out break in 2002, Dr. Karunakaran was actively involved in SARS research along with other scientists at BCCDC to monitor and control the spread of the SARS virus . He developed serological assays to detect SARS induced antibodies in humans and involved in the testing of different SARS vaccine candidates both in mouse and ferret models as part of SARS Accelerated Vaccine Initiative. During his post-doctoral work with Dr. Julian Davies at the Department of Microbiology & Immunology at University of British Columbia he studied the development of multiple antibiotic resistance in mycobacteria. His study suggested that the generation of multiply drug resistant strains by successive mutations may be a more complex genetic phenomenon than suspected. Dr. Karunakaran’s PhD work on Molecular Biology involved characterization of temperature sensitive and copy number mutants of the broad-host-range plasmid RK2 in order to exploit its biology in different gram negative bacteria. The knowledge he generated through this study helped to understand RK2 biology in general as well as to construct many RK2 plasmid based expression vectors. Krajden, M., Cook, D., Yu, A., Chow, R., Su, Q., Mei, W., McNeil, S., Money, D., Dionne, M., Palefsky, J.M., Karunakaran, K.P., Kollmann, T., Ogilvie, G., and Petric, M., Dobson, S. 2014. Assessment of HPV 16 and HPV 18 antibody responses by pseudovirus neutralization, Merck cLIA and Merck total IgG LIA immunoassays in a reduced dosage quadrivalent HPV vaccine trial. Vaccine. 32:624-30. PubMed PMID: 24055350. Yu H, Karunakaran KP, Jiang X, Brunham RC. 2014. Evaluation of a multisubunit recombinant polymorphic membrane protein and major outer membrane protein T cell vaccine against Chlamydia muridarum genital infection in three strains of mice. Vaccine. 32:4672-80. PubMed PMID: 24992718. Yu H, Karunakaran KP, Jiang X, Shen C, Andersen P, Brunham RC. Chlamydia muridarum T cell antigens and adjuvants that induce protective immunity in mice. Infect Immun. 2012 Apr;80(4):1510-8. doi: 10.1128/IAI.06338-11. Johnson RM, Yu H, Kerr MS, Slaven JE, Karunakaran KP, Brunham RC. PmpG303-311, a protective vaccine epitope that elicits persistent cellular immune responses in Chlamydia muridarum-immune mice. Infect Immun. 2012 Jun;80(6):2204-11. Yu H, Karunakaran KP, Kelly I, Shen C, Jiang X, Foster LJ, Brunham RC. Immunization with live and dead Chlamydia muridarum induces different levels of protective immunity in a murine genital tract model: correlation with MHC class II peptide presentation and multifunctional Th1 cells. J Immunol. 2011 Mar 15;186(6):3615-21. Krajden M, Cook D, Yu A, Chow R, Mei W, McNeil S, Money D, Dionne M, Karunakaran KP, Palefsky JM, Dobson S, Ogilvie G, Petric M. Human papillomavirus 16 (HPV 16) and HPV 18 antibody responses measured by pseudovirus neutralization and competitive Luminex assays in a two- versus three-dose HPV vaccine trial. Clin Vaccine Immunol. 2011 Mar;18(3):418-23. Karunakaran KP, Yu H, Foster LJ, Brunham RC. Development of a Chlamydia trachomatis T cell Vaccine. Hum Vaccin. 2010 Aug;6(8):676-80. Yu H, Jiang X, Shen C, Karunakaran KP, Jiang J, Rosin NL, Brunham RC. Chlamydia muridarum T-cell antigens formulated with the adjuvant DDA/TDB induce immunity against infection that correlates with a high frequency of gamma interferon (IFN-gamma)/tumor necrosis factor alpha and IFN-gamma/interleukin-17 double-positive CD4+ T cells. Infect Immun. 2010 May;78(5):2272-82. Jiang X, Shen C, Yu H, Karunakaran KP, Brunham RC. Differences in innate immune responses correlate with differences in murine susceptibility to Chlamydia muridarum pulmonary infection. Immunology. 2010 Apr;129(4):556-66. Krajden M, Karunakaran K, So S, Palefsky JM, Sharma R, Cook D, Yu A, Chow R, Dobson S, Ogilvie GS, Petric M. Prevalence of human papillomavirus 16 and 18 neutralizing antibodies in prenatal women in British Columbia. Clin Vaccine Immunol. 2009 Dec;16(12):1840-3. Dr Karuna Karunakaran’s present research at UBC CDC involves identifying vaccine targets for Chlamydia trachomatis. The overall objective of this project is to validate a novel dendritic cell-based immunoproteomics technology as a means of identifying novel T cell antigen candidates for the development of efficacious vaccines for important intracellular pathogens such as C. trachomatis. Dr Karunakaran’s past work at UBCCDC involved investigating the roles played by the C. pneumoniae bacteriophage phiCpn1 in relation to C. pneumoniae pathogenesis of atherosclerosis. His post-doctoral work with Dr. Julian Davies at the Department of Microbiology & Immunology at UBC involved studies on the mechanisms of antibiotic resistance in mycobacteria. In this work he studied the development of multiple antibiotic resistance in mycobacteria. His Ph.D. work in Molecular Microbiology involved characterization of temperature sensitive and copy number mutants of the broad-host-range plasmid RK2 in order to exploit its biology in different gram negative bacteria.